Losing the stored data is the worst nightmare of any person who is using even the most secured Mac Computers. In today’s time when all the information – be it your personal or official is stored on your computers and you cannot afford to lose it even by mistake. But their would be instances when you would accidentally delete files on your most trustworthy Mac OS X system. In such a situation, you need not despair as there are many Mac Data recovery software that are available for you to try out but we suggest you to end your search with Disk Drill Mac OS X Data Recovery Software and list below the steps how to recover deleted files mac. To start with, you can use basic version of Disk Drill which can be found on https://www.pandorarecovery.com and that can be downloaded for free. Disk Drill is invaluable, simple, easy and do-it-yourself solution to recover deleted files on Mac OS X. This data recovery software can get your data back regardless of your reason for data loss — accidental deletion, Disk Utility error or data corruption. Disk Drill can be used to recover data from Mac computers or external sources that are connected to it, including iPads. The beauty of this software is that Plenty of tutorials are provided and you can simply follow these tutorials and complete the recovery process via this data recovery software for free. It also shows you a preview of the file, which can be recovered. Disk Drill has a modern UI that is very simple, polished and responsive and ensures fast data recovery. Disk Drill recoverry software supports 350+ File Types and can read any device formatted with HFS & HFS+, FAT/FAT32/exFAT, NTFS, or EXT3/EXT4. With this software, you can recover files of various formats such as photos like JPG, PNG and TIFF, videos like AVI, DV and MP4, RAW camera images like CR2, NEF and DNG, graphics files like AI, PSD, and INDD, music files like AIF, MP3 and WAV and documents like DOCX, PPTX and XLSX. 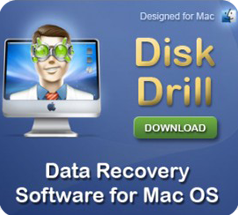 Disk Drill has various file recovery features for your Mac and your lost data can be recovered in any situation. For instance if the drive fails, loses a partition, or you need to prevent important data from being overwritten, this software has tools to address to these situations. Its Quick scan and Deep Scan features make it easier for you to recover the lost files very fast. Quick Scan recovers your Mac files with all their data intact — including file names and locations. This method infact is ideal to recover evn Trash on your Mac OS X after it has been emptied. On the other hand, Deep Scan handles tasks no other scanning solution can handle such as scanning for files when no valid partition is found. Moreover, Disk Drill makes it easy to find the files you were looking for by their full or partial name, type and extension, file size, creation or modification dates, etc. It also has feature of Recovery Vault data protection provided you installed Disk Drill before you lost the data, and which runs in the background of your machine and monitors your hard drives for changes or file deletions. It saves the data of the files for future recovery and has a 100% success rate. We have used this recovery software on our Mac System and can say that we were very much satisfied with its recovering capabilities. We have been successful in recovering lost documents with success rate of upto 98 percent which is too good for a free software. In some scenarios of media files comprising of audio and video files, our success rate was around 90 percent which too in our opinion is not bad.